Checks are the means by which QF-Test validates correctness of the SUT. If the current state of a component doesn't match the expected value of the check node a message with a configurable error level is written to the run-log. Additionally or alternatively a CheckFailedException can be thrown and the result of the check can be assigned to a variable. By setting a 'Timeout' checks can also be used to wait for a component to attain a certain state, e.g. to wait for a MenuItem to become enable or for a CheckBox to become selected. Like events each check must have a target window, component or sub-item. Depending on that target, different kinds of checks are supported which can be recorded in check-mode as described in section 4.3 via right-clicking the target component and selecting the check from the resulting menu. In case you need a check for a special component that is not offered by default you can implement custom checks via the Checker extension API described in section 47.5. There are six different data types available for checks and each of these corresponds to a specific check node. Because it is possible to have different checks of the same data type for the same target component, e.g. for the enabled state and the editable state of a text field, both boolean, checks are further qualified by their 'Check type identifier' attribute. In most cases, when data type and target component are sufficient to uniquely identify the kind of check, the value of this attribute is default. In case the specified check is not supported for the given target component a CheckNotSupportedException is thrown. Validates the text displayed in a component or sub-item. Execution: The text is sent to the SUT together with the data about the target component. The TestEventQueue determines the corresponding component in the SUT, reads its displayed text and compares it to the required value. The name of the SUT client process to which the check is sent. The 'QF-Test ID' of the 'Window', 'Component' or 'Item' node that is the target of the check. The value to which the text displayed by the component or sub-item is compared. Restrictions: Valid regexp if required. If this attribute is set, the component's text is matched against a regexp (see section 44.4) instead of comparing plain strings. This flag determines whether to execute a positive or a negative check. If it is set, a negative check will be performed, i.e. the checked property must not match the expected value. Time limit in milliseconds until the check must succeed. To disable waiting, leave this value empty or set it to 0. Restrictions: Must not be negative. This optional attribute determines the name for the result variable of the action. If set, the respective variable will be set to 'true' for a successful check or wait and to 'false' in case of failure. Note If this attribute is set, the attribute 'Error level of message' is ignored and no error is reported. 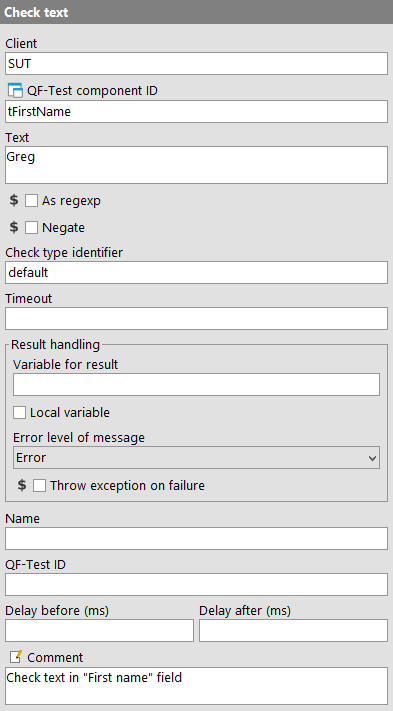 The attribute 'Throw exception on failure' always remains effective, so it is possible to set a result variable and still throw an exception. This flag determines whether to create a local or global variable binding. If unset, the variable is bound in the global variables. If set, the topmost current binding for the variable is replaced with the new value, provided this binding is within the context of the currently executing 'Procedure', 'Dependency' or 'Test-case' node. If no such binding exists, a new binding is created in the currently executing 'Procedure', 'Dependency' or 'Test-case' node or, if there is no such node, in the global bindings. See chapter 7 for a detailed explanation of variable binding and lookup. This attribute determines the error level of the message that is logged in case of failure. Possible choices are message, warning and error. 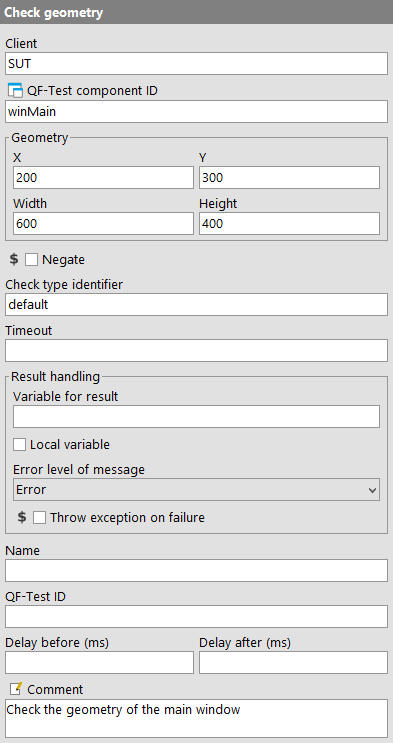 Note If the attribute 'Throw exception on failure' is set, this attribute is irrelevant and if 'Variable for result' is set this attribute is ignored. Throw an exception in case of failure. For 'Check...' nodes a CheckFailedException is thrown, for 'Wait for...' nodes the respective specific exception. An optional name for the 'Check', mostly useful for the report. Compares the current state of a component or sub-item with an expected value. Execution: The expected state is sent to the SUT together with the data about the target component. The TestEventQueue determines the corresponding component in the SUT, determines its state and compares it to the required value. The value to which the current state of the component or sub-item is compared. This attribute specifies the kind of check to perform. This makes it possible to support different kinds of checks of the same data type for a given target component without any ambiguity. 'Boolean check' nodes in particular are often used to check different kinds of states like 'enabled', 'editable' or 'selected' (like described in section 38.9). The following table explains some of the check types. It depends on the component class which check types are actually available. 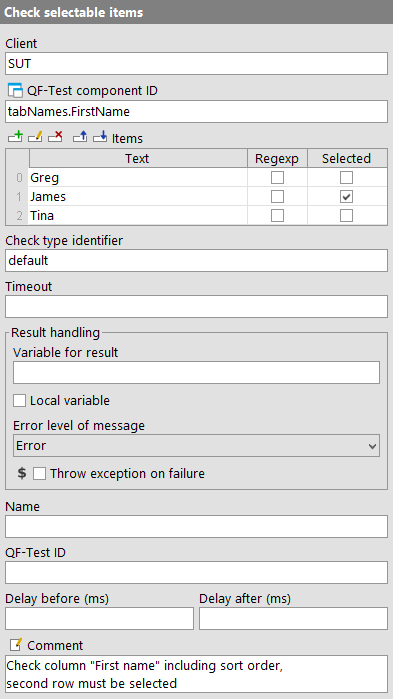 With the help of a Checker additional check types can be implemented as shown in section 47.5.
visible Example 1 shows a invisible Textfield and CheckBox.. Both are visible at Example 2.
editable Example 1 shows a Textfield which is not editable. The Textfield at Example 2 is editable. The CheckBox does not support this kind of check. enabled Neither the Textfield nor the CheckBox is enabled at Example 1, which means you cannot interact with them. Example 2 shows enabled components. checked (former selected) Example 1 shows a CheckBox which is not selected. It is selected at Example 2. The Textfield does not support this kind of check. selected (Table) Example 1 shows a Table where no cell is selected. The lower left cell is selected at Example 2, indicated by a frame. The check concerns the selection, not the CheckBox. focused Example 1 shows a focused Textfield (indicated by the cursor). The CheckBox is focused at Example 2 (indicated by a frame). Validates multiple displayed text strings in a component or sub-item. Execution: The text strings are sent to the SUT together with the data about the target component. The TestEventQueue determines the corresponding component in the SUT, reads its displayed values and compares them to the required values. This table holds the values to which the text strings displayed by the component or sub-item are compared. Each row represents one sub-item of the target component. The "Text" column holds the actual value while the "Regexp" column determines if this value is treated as a plain string or as a regexp (see section 44.4). The "Regexp" column allows using a variable via performing a double click on the respective cell. See subsection 2.2.5 about how to work with tables in QF-Test. 4.0+ You can select »Escape text for regular expressions« from the context menu for escaping special characters of regular expressions of that cell text. Variable: Yes for the "Text" column, otherwise no. This attribute specifies the kind of check to perform. This makes it possible to support different kinds of checks of the same data type for a given target component without any ambiguity. With the help of a Checker additional check types can be implemented as shown in section 47.5. Validates multiple displayed text strings in a component or sub-item and additionally checks their selection state. Execution: The text strings and selection state data are sent to the SUT together with the data about the target component. 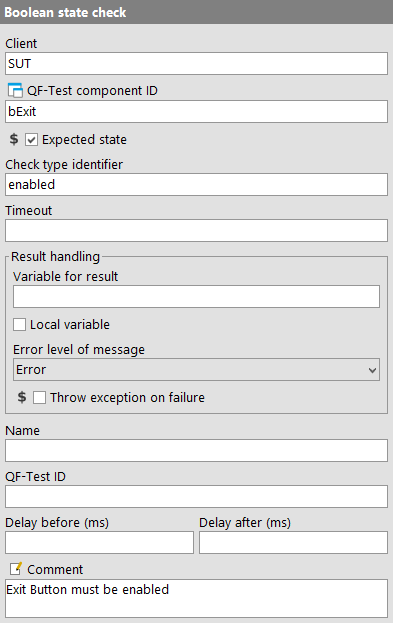 The TestEventQueue determines the corresponding component in the SUT, reads its displayed values, compares them to the required values and checks the required selection state. This table holds the values to which the text strings displayed by the component or sub-item are compared. Each row represents one sub-item of the target component. The "Text" column holds the actual value while the "Regexp" column determines if this value is treated as a plain string or as a regexp (see section 44.4). The "Selected" column holds the required selection state. The "Regexp" and the "Selected" column allow using a variable via performing a double click on the respective cell. Checks the displayed image of a component. This check is supported for all kinds of components and for sub-items. It is possible to check only parts of an image. To that end, a region within the image can be defined, either by dragging a rectangle or by editing the region attributes. Also, if the check image is smaller than the component, an offset into the component can be given. When recording only the visible part of a component or when cropping the check image to size after defining a region, the offset is determined automatically. Execution: The image data is sent to the SUT together with the data about the target component. The TestEventQueue determines the corresponding component in the SUT and compares its current image to the required value. If the image is smaller than the component, these offset coordinates together with the size of the image determine the sub-region of the component that is checked. The recorded image of the component. It can be displayed at different zoom levels, saved to or loaded from disk in the PNG format, or edited in an external imaging tool. The tool to use must be defined with the option External imaging program. If only some part of the image of a component needs to be checked, a region within the image can be defined that will then be searched for in the displayed image of the component. This attribute defines a special algorithm for image comparison. See Details about the algorithm for image comparison for further information. Restrictions: Must match a special syntax. This attribute specifies the kind of check to perform. This makes it possible to support different kinds of checks of the same data type for a given target component without any ambiguity. The standard check type is 'default'. There are two special check types for PDF, 'scaled' and 'unscaled', which are described in the PDF subsection 15.3.2. With the help of a Checker additional check types can be implemented as shown in section 47.5. Checks the location and size of a component. This check is supported for all kinds of components but not for sub-items. Execution: The geometry data is sent to the SUT together with the data about the target component. The TestEventQueue determines the corresponding component in the SUT and compares location and size to the required values. The X/Y coordinates, width and height to which the location and size of the component are compared. To check only some of these, e.g. just the location or just the size, leave the others empty.